Relatives of the slain 22-year-old spoke at the United Nations Permanent Forum on Indigenous Issues in New York. 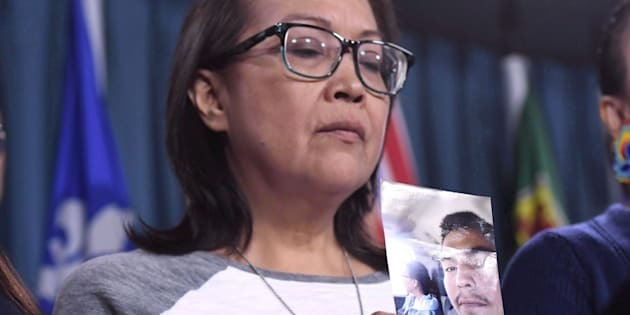 Debbie Baptiste, mother of Colten Boushie, holds a photo of her son during a press conference on Parliament Hill in Ottawa on Feb. 14, 2018. She and other relatives of the 22-year-old spoke at the United Nations on Tuesday. Family and supporters of a young Indigenous man shot and killed on a Saskatchewan farm used the international stage of the United Nations Tuesday to advocate for change in the Canadian criminal justice system. A side event at the United Nations Permanent Forum on Indigenous Issues in New York focused on the death of 22-year-old Colten Boushie and his family's experience with police and the courts. Farmer Gerald Stanley was acquitted in Boushie's August 2016 death earlier this year, sparking rallies and outrage across the country. Boushie's cousin Jade Tootoosis said silently sitting in the courtroom during the trial "was the most traumatic thing" for the family. When the verdict came out, she said her "world just crumbled." Colten Boushie, 22, died after being shot in the head on Gerald Stanley's farm in 2016. Stanley was acquitted of murder. "Ultimately, I wanted to have hope that something would come of this, that Indigenous people, that we are not just seen as criminals like they continue (to make) my brother out to be," Tootoosis said. Boushie, who was a member of the Red Pheasant First Nation, and four other young people drove onto Stanley's farm near Biggar, Sask., in 2016. During the trial, Boushie's friends told court they were looking for help with a flat tire. But Stanley testified he thought the group was trying to steal an all-terrain vehicle. He said he fired warning shots to scare them away and the gun accidentally went off again when he went to pull the keys from their SUV. Boushie was shot in the back of the head as he sat in the front seat. Tootoosis was part of a delegation that included Boushie's mother, Debbie Baptiste, his uncle Alvin Baptiste, Saskatchewan lawyer Eleanore Sunchild, the family's lawyer Chris Murphy and former Red Pheasant First Nation chief Sheldon Wuttunee. Sheldon Wuttunee puts his arm around Debbie Baptiste, mother of Colten Boushie, while she pauses as the family speak to reporters at Parliament in Ottawa on Feb. 13, 2018. The group criticized the jury selection process, which resulted in no visibly Indigenous jurors, the Crown's communication with the family and the RCMP investigation into Boushie's death. "Justice was not served through the legal system," Wuttunee said. Tootoosis said the family wanted to share their story but also advocate for all Indigenous people who have dealt with racism and the court system. She said her cousin's death showed it is no longer an Indigenous issue or a Canadian issue — it is a human rights issue. "We are entitled to justice, fairness and equality, but it is denied," she said. Stanley pleaded guilty Monday to unsafe storage of an unrestricted firearm and was fined $3,000. He received a 10-year ban on possessing a firearm and forfeited his guns. The Crown dropped a second count of unsafe storage of a restricted handgun. Tootoosis said it showed that an Indigenous life is worth less than an all-terrain vehicle. "He was shot in the back of the head, executed, because this white man saw a quad was worth more than his life. We are human beings," she said. The United Nations Permanent Forum on Indigenous Issues holds a two-week session each year.